Kenenisa Bekele will make his marathon debut in Paris in April after the prospect of a clash with Mo Farah in London failed to materialise. 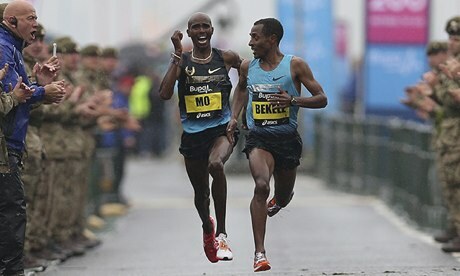 Ethiopia's three-times former Olympic champion had been widely tipped to line up alongside Farah at the London Marathon, but the race director, Dave Bedford, said recently it had become an unlikely prospect. Paris Marathon organisers confirmed in a statement on Thursday that Bekele will instead line up in their race on 6 April – seven days before Farah makes his own debut at the 26-mile distance. The statement said: "Kenenisa Bekele, triple Olympic champion and five-times world champion over 5,000m and 10,000m, will line up at the start of the 38th edition of the Schneider Electric Paris Marathon. "The 31-year-old Ethiopian athlete will make his debut in the marathon on 6 April with the aim of having a shot at the times of the world's best runners over the distance."